The uncompromisingly perfect hard apple cider from Kelterei Possmann Frankfurt Germany. 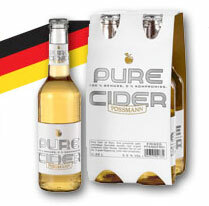 Possmann Pure Cider has a perfect balance of rich apple flavor while not to sweet and finishing dry. The flavor comes from our unique source of apples which are harvested exclusively from our 800+ farmers in the Hessen region of Germany. Our typical framer has 3 to 15 naturally occurring apple trees on their land that are not part of a cultivated orchard. These country apples provide a uniquely rich apple flavor. Try a chilled Pure Cider, no need for ice, it’s an uncompromisingly prefect hard apple cider. Click here for Pure Cider retailers. 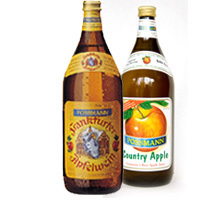 For over 125 years, the Possmann family has made traditional German apple wine and apple juice in the manner first handed down by Phillipp Possmann in 1881. Today, Possmann holds true to a spirit of Old World craftsmanship and a dedication to quality. Possmann’s fine wines and juices are now available to our friends in the United States. For more information on our products, please explore the products section. To find out how to become a dealer of Possmann’s juices and wines, click here.